The manuscript for the 2nd edition is done. Two brand new chapters, 19 new illustrations, 1 new table, 24 revised illustrations, and revisions of all the other chapters. This is a major update to GIS Cartography: A Guide To Effective Map Design. When I know more about its publication date I’ll be sure to post. As of now, I believe we’re looking at sometime in 2014. Cheers and Happy Halloween! I know I’ll be I’m celebrating. Now there’s a freeing thought! The elite feel there is only one way to do something: their way. It’s true that there are better ways and worse ways but no one way to make a map. At the workshop I taught at CSU last year we put out about 5 different map designs, all showing the same data but in different ways, and asked the students to stand by the one they liked the best. There were definitely some maps in the group that didn’t measure up. Everyone agreed on that because nobody stood by them. However, there were two maps that were of the same caliber design-wise and the students split themselves more or less evenly between those two. With the two maps it all came down to color scheme. Some liked the bold, more “youthful” color scheme while others liked the more traditional, subtle palette. Both maps were equally effective in communicating the information. A critic’s job (often self-appointed) is to nit-pick, to deem something worthy or unworthy of your time. They don’t make maps. You do. Drop shadows are an easily overlooked design technique that can enhance the map by separating certain features such as legends and focal polygons visually from the rest of the map layout. Map readers may not be immediately cognizant of the drop shadow but it helps their understanding and appreciation for the map just the same. As map makers, we need to be aware of this subtle yet powerful graphic element. We’ll start with some examples of drop shadows on existing maps and map layouts and then proceed to a few notes on how to apply a drop shadow in ArcMap and Illustrator. From “New Plants on the Way?”, a map accompanying a 2006 article in the New York Times, Slow Start for Nuclear Reactors. This is a classic drop shadow applied to the United States to separate it from the rest of the infographic. From “Getting to the Tidal Basin Blossoms”, a map accompanying a 2005 article in the Washington Post, Cherry Blossom Guide. This drop shadow provides a clear 3D height difference between the land and water. A portion of the Marymoor Park map by Matt Stevenson, CORE GIS LLC. Notice the drop shadows underneath the leader lines. They provide an important figure-ground differentiation. 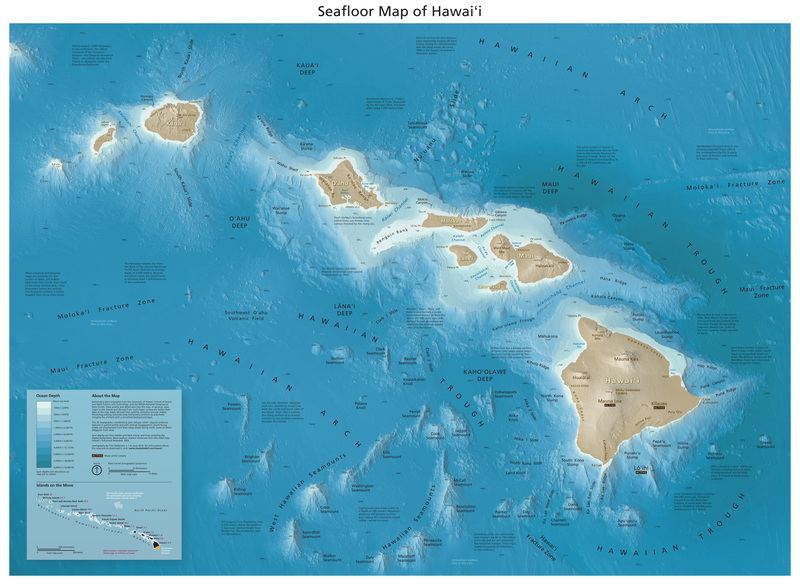 A portion of the Seafloor Map of Hawaii map by Tom Patterson, who maintains shadedrelief.com. The extremely subtle drop shadow to the bottom and right of the legend adds to the finished look of this exquisite map. ARCGIS To create drop shadows in ArcMap, you must have ArcEditor or ArcInfo, and your data needs to be converted to a geodatabase. Use the representation > symbology tab. A tutorial on creating drop shadows this way is available on the ArcGIS resources site. If you only have the ArcView version of ArcMap, you can create a simple rectangular drop shadow for a simple rectangular legend by creating a rectangle graphic and offsetting it from the legend graphic. You can also create a rudimentary drop shadow by converting an irregular polygon feature to a graphic and then symbolizing that graphic via a gradient. Warning: at least in prior versions of Arc (I haven’t tried this in 10), gradient symbology was resource intensive and took a long time to render. Additionally, you can play with concentric buffers whereby each one is slightly lighter in color and more transparent than the last. ILLUSTRATOR Select an object or an entire layer, then go to effect>stylize>drop shadow and click ok.